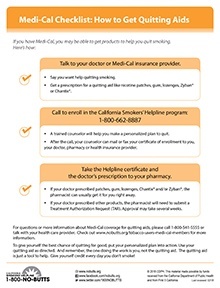 The California Smokers’ Helpline can help you quit smoking or other tobacco use. We have trained, caring professionals who will work with you to create a plan and stick to it. 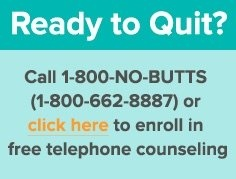 Call 1-800-NO-BUTTS or click here to sign up online. NicoDerm CQ® patches release a steady stream of nicotine into your body through your skin. They make quitting easier by weaning you off nicotine slowly. Prescriptions are available for 14 weeks. Nicorette© gum when chewed right releases nicotine, which is then absorbed through the lining of the mouth. It helps reduce withdrawal symptoms such as cravings. Prescriptions are available for 14 weeks. Nicorette© lozenges are placed in the mouth like hard candy and releases nicotine through the lining of the mouth as it slowly dissolves. It helps reduce withdrawal symptoms such as cravings. Prescriptions are available for 14 weeks. Zyban® is a form of the anti-depressant Wellbutrin®. It is a pill that does not contain nicotine. It helps with changes in brain chemistry that may occur when you quit smoking. Start taking it 1-2 weeks before you quit. Prescriptions are available for 12 weeks. Chantix® is another quitting aid that does not contain nicotine. It is a pill that reduces cravings for nicotine by blocking the pleasure of smoking. Start taking it a week before you quit. Prescriptions are available for 12 weeks. If your prescription is for one of the products above, a pharmacist can fill it right away. You don’t need Medi-Cal pre-approval. You can receive two courses of treatment per year, with no waiting in between. However you decide to quit, don’t give up. It may take several tries to quit for good. Every time you try, you get closer to your goal of quitting for good. You can do it! Download our free Medi-Cal checklist!